Nearby campsites: At the park. Comments: This is a great family park, with kids everywhere. The ramp is good but the dock is marginal. OK launch, but watch out when windy. 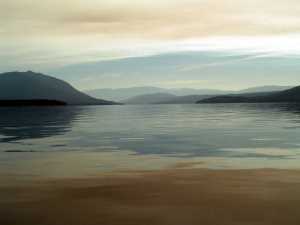 ---------Shuswap is a delightful diversion. It's not on the main trunk of the Columbia River, but lies to the west. But, sometimes the best fruit grows on the branches and twigs and exploring a river requires a little roaming along the limbs. 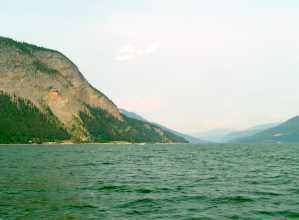 Shuswap drains southerly into the Okanagan River, a tributary of the Columbia. We had heard about Shuswap last year when scouting out the top branches of the Columbia tree. 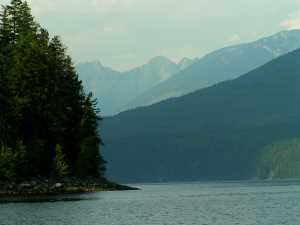 Canadians recommended it as a "must see" lake, and although we are a little shy about "must sees," it was directly on our route from the Gulf Islands to the headwaters. So, we diverted. ---------The lake is large, shaped like a squashed letter "H." We launched at the lower end of the southwestern leg at a very busy Provincial Park. We checked out the ramp the night before and it was a madhouse - with no real dock beside the ramp, a zillion ski-boats were jockeying for position to pull out and trucks and trailers were playing dodge-em cars in the staging area. We decided to launch early the next morning before families were heading to the lake. It's easier to compete with early-morning fishermen than ski-boaters. ---------So, not long after sunrise we headed to the ramp. No one. Not a soul. Not even a trailer in the lot. We had a leisurely launch, drove the trucks back to the campsite, and were soon on the water. The lake was also still asleep - flat calm. The reflections of the Rockies quivered upside down ahead of our bow. ---------This is not a wilderness arm of the lake. Tents, R.V. 's, and houses lay splattered along the shores and, by afternoon, water skiers would be slicing the reflections. 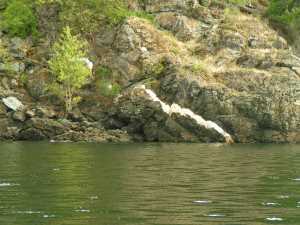 The shoreline was embellished, however, with striking quartz veins intruding through the dark country rock. 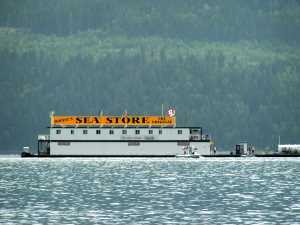 ---------We slipped through the cross-bar of the "H," Cinnemousin Narrows, and there discovered one of the traditions of Shuswap - the Floating Sea Store. In fact, in the spirit of competition, there were TWO floating stores. Fuel, food, and ice cream was available, miles from the nearest town. 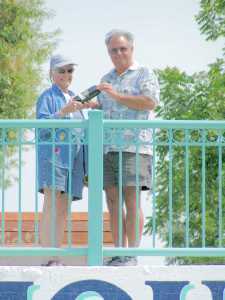 ---------As the day unfolded, it soon became apparent why so many Canadians love Shuswap. 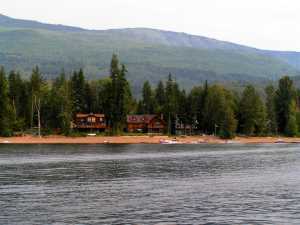 There are sandy beaches everywhere, the water is warm (71 degrees that day), and it is the houseboat capital of Canada. 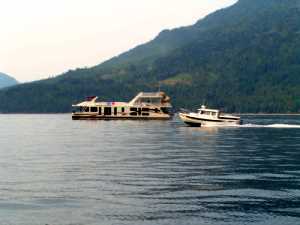 In fact, there are two manufacturers of houseboats located on the lake. As we approached Sicamous, the "fun center" of the lake, houseboats had to wait their turn (directed by a shoreside radio dispatcher) to enter the narrows. 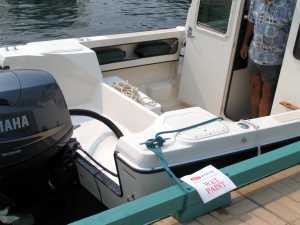 ---------We dodged the paddlewheeler, houseboats, and a high speed ski boat who was on the wrong side of the red nun (and fetched up on a sand bar) and tied off at the public dock in Sicamous. A chap was shouting something unintelligable at us, and soon came down to the dock and taped a message beside Chris's dock line. 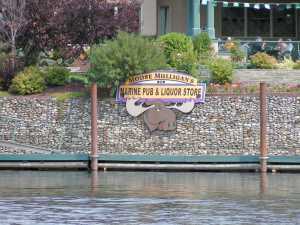 ---------To show no hard feelings, we properly toasted the town and headed off to Moose Mulligan's "Marine Pub" for some "shore food." 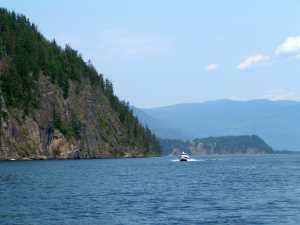 ---------After resupplying our bodies and the boat larders, we headed off to explore the other arms of Shuswap. 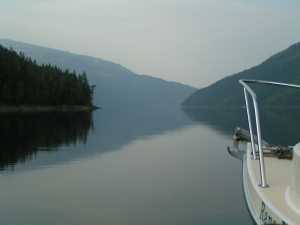 ---------Toward dusk, we headed northerly up the undeveloped northeast arm, Ansley, to the top end and found a delightful anchorage in the shelter of the glacier-capped Monashee Mountains. 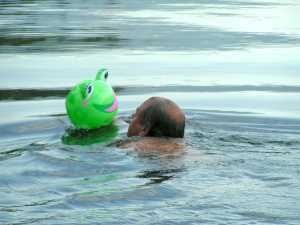 Both the lake and air were still languorously warm, so Chris was soon swimming with his companion, Rana Verde. ---------We swung lightly on the hook, after dinner, listening to the mournful wails of a Loon. We recalled the beautiful Northwest Native legend of how Loon lost her beautiful singing voice, while attempting to rescue daylight from it's prison in an evil spirit's box. 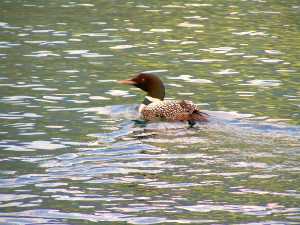 The evil spirit discovered Loon and tried to strangle him, twisting his neck, and destroying his song. Raven followed Loon's lead, and freed the light. So, now we have daylight, but as darkness returns at the end of day, Loon remembers the loss of his beautiful voice, and he sadly wails his haunting call.